The unexpected can be stressful for any family. Illnesses, burst pipes, or the loss of a family pet can seem overwhelming but there is great comfort in knowing that someone is thinking of you when those events happen. If a friend or family you care about is going through the unexpected, you can brighten the day with a meal gift basket that takes something off the list. Not having to worry about making dinner or run to the market is a kindness that anyone experiencing stress will appreciate. Healthy Family Meals Gift Basket: For larger families or for multiple meals, this gift basket is a perfect fit. Enjoy chicken and pasta, chili, soup, and more – both sweet and savory! – in this thoughtful gift basket. Hearty Chili Fixins Dinner Basket: A delicious serving of chili can feel like a hug in a bowl. Our hearty chili gift basket includes chili ingredients, as well as sweet treats, cheese, and coffee. 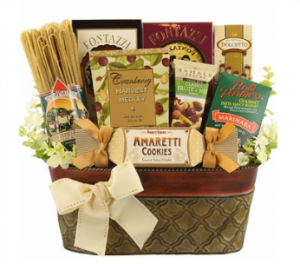 Classic Cheer Meal Basket: Treat a friend or loved one to a comforting spaghetti dinner with this beautifully assembled basket featuring pasta, sauce, and other gourmet Italian goodies. No matter which meal basket you choose from our selection of gifts, you can rest assured that you’ll be sending the best of thoughts to someone in need. Visit BisketBaskets.com to see these baskets and to ship one in a timely manner. Every relationship you form in business is just that: a relationship. It requires give and take, communication and consideration, and at the most important of moments, reassurance that there is thought and care put into each and every interaction. Unique corporate gift baskets can be a wonderful way to express your appreciation or to send the right signals to your client or partners. You care and you’re always there when they need you. 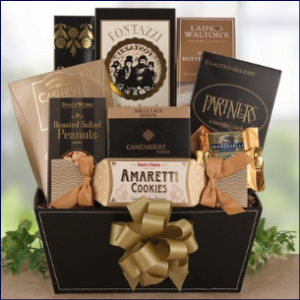 Not sure when is the right time to send a corporate gift basket or another token of appreciation? Try it when…. Acquiring a new company or a major client can be an exciting and exhausting journey for a business but it is also a momentous moment that merits celebration. Say “Congrats!” with a unique corporate gift basket that is a real crowd-pleaser, like our Corporate VIP Gift, which is filled to the brim with tasty gourmet treats, both sweet and savory. In your own ranks, it’s important to show appreciation for those who work tirelessly in pursuit of your organization’s goals. Longtime employees celebrating 10, 15, or even 20+ year anniversaries will feel appreciated when they receive a personal note from the CEO along with a World of Thanks Gift Tower or another treat from our selection of corporate gifts. Awards are symbols of a job well done for those who receive them, but it can be just as delightful to receive a message of congratulations from a trusted business partner when you celebrate a win. Send a note of congratulations along with The Ritz Corporate Gift Basket, loaded with gourmet foods to delight any office. Shop all of our unique corporate gift baskets today at BisketBaskets.com!